The man identifying himself as Mark Ruppert and claiming to be of Sweden founded Movement Against Karimov. The new structure has a page in LiveJournal which begins with "Appeal to the people of the Republic of Uzbekistan". "Uzbek structures of state power under Islam Karimov have been promoting a policy of violence and crimes against the people for over a decade. Repressions against the discontented continue along with harassment and prosecution of victims and witnesses of the tragedy in Andijan. The Lutherans and representatives of other confessions are hunted down and prosecuted. Penal responsibility for homosexuality has never been abolished. Journalists, human rights activists, and anyone at all with the stamina to speak up are under colossal pressure." According to Ruppert, he is out to help the people of the republic "to rid itself of Karimov and his criminal clique that seized the country." "Tyrant must be unseated" is the slogan of the movement. And how does the movement plan to accomplish it? Analysis of its materials on the web site leaves the impression that hopes are pinned on the efforts to force decisions of European courts on Uzbekistan. "Movement Against Karimov prepares a lawsuit to the Hague Tribunal against President of Uzbekistan Islam Karimov. 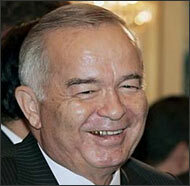 Should Uzbek courts refrain from accepting lawsuits against Karimov, this lawsuit will be initiated. It is to be filed in the hope to have Karimov's criminal actions condemned and him himself unseated." It appears that the idea is as follows: should the Hague Tribunal decide to tell Karimov "Naughty, naughty", the latter will get into a huff and mutter "I just knew it. All right, do whatever pleases you then because I'm through with all of you. I resign. I'd better go and harvest me some cotton then." Is that what it is supposed to accomplish? Triumph of democracy in Uzbekistan just like that? Isn't it somewhat naive? Ferghana.ru contacted Ruppert himself. Ferghana.Ru: Why would you organize this movement? Mark Ruppert: I have personal reasons to do so. Besides, I represent interests of my friends and business partners who have their own reasons to want litigation. Ferghana.Ru: Where and how did this whole idea originate - to file lawsuits with European courts? Mark Ruppert: Being in Europe and with a lawsuit filed, one may count on an indemnity for the inconveniences engineered by the authorities of Uzbekistan. That goes for absolutely everyone who proves his case to European court's satisfaction. Ferghana.Ru: And who will pay the indemnity? Europe? "In my opinion Mark Ruppert confuses Hague tribunal with International criminal court (ICC) and European Human Rights Court (Strasburg court). Since Uzbekistan is not the member of European Convention for the Protection of Human Rights and Fundamental Freedoms and bears no responsibility under its framework this means that appealing to Strasburg court with such case as "Tutkin is against Uzbekistan" is impossible", says Elena Ryabinina, the Moscow-based expert on work with refugees from Central Asia. – "I am afraid that, unfortunately, in this case we are dealing with the traditional peculiarity of post-Soviet mentality (the origins of Uzbekistan has that on maximum level – perhaps, due to many years, spent in absolutely authoritarian system): good intentions without any understanding of mechanisms and area of their application". Mark Ruppert: We know that making Uzbekistan pay is impossible. If, however, the guilt of Karimov and his regime is established, then the court might arrest Uzbek property abroad. I mean real estate, transport means, etc. These assets will be sold then and the money thus raised will be paid as indemnity. Ferghana.Ru: What is the membership at this point? How many lawsuits have been filed? Mark Ruppert: We hoped to get 30 lawsuits at first... well, perhaps 50 or even 60. The idea was that every victim [of Karimov's regime] will demand 50,000 euros on the average, and the sum total will reach 2-3 million euros. Enough to warrant arrest of assets, you know. As it happened, however, people from all over the European Union started joining the movement - people from Great Britain, Italy... Approximately 300 would like to participate in the project at this time. That's the last week estimate [this interview took place on October 21]. Ferghana.Ru: What courts will the initial suits go to? Mark Ruppert: Applicants' local courts - village and district ones. Ferghana.Ru: Are you saying that European village courts will accept something as serious as lawsuits against the government of Uzbekistan? Mark Ruppert: You take it for naivete? Look how Pinocet was brought to trial. Parallels are quite telling, I'd say. His victims had filed lawsuits against Pinocet all over Europe then and he himself finally turned up in Great Britain for medical treatment. Verdicts 5-7 years old were brought up then, taken to police precincts, then to the London police, and Pinocet was bagged in London. And tried. Same principle applies here. An Uzbek living in the European Union should go to the police with a complaint against the Uzbek authorities. If this claim is substantiated, then the police must consider the matter. You may have doubts of course but browse Google and you will see how Pinocet fared. This correspondent did browse Google. Augusto Pinocet came to London for a course of treatment at a private clinic in 1998. He was arrested for murder (the warrant issued in Spain) right there, in London. Spain demanded his extradition because hundreds of Spanish nationals had been murdered or disappeared without a trace in Chile in the years of his presidency. (It is necessary to add that Pinocet was no longer the president at the moment of arrest, he had resigned in the aftermath of a referendum and remained a senator for life.) The House of Lords decided in 1999 that Pinocet was not to be held responsible for whatever he had done before 1988 (i.e. during presidency). Once the term of house arrest ended, Pinocet departed Great Britain for Chile where he was stripped of senatorial immunity. Charges (manslaughter, abduction by force, tortures) were pressed against Pinocet in Santiago but that was essentially where the matter ended. Courts invariably decided not to convict a former dictator suffering senile imbecility. A series of trials followed but not one of them ended in actual conviction. Pinocet died in peace at home, surrounded by his children and grandchildren. Sure, the trials had been a pain in the neck but saying that he did suffer would be an exaggeration. Besides, everything had started in Europe but most trials took place in Chile. The more this correspondent read about Pinocet and his trials, the less solid looked parallels between Chile then and Uzbekistan now, between ex-president Pinocet and incumbent President Karimov, between independent courts in this Latin American country and what passes for them in this Central Asian one. Some more questions to Ruppert meanwhile demanded answers. Ferghana.Ru: What are the lawsuits about? Conviction of regime or indemnity? «There are many various international courts in Hague but none of them has jurisdiction over Uzbekistan. The Republic of Uzbekistan has not ratified the status of International Criminal Court (ICC); therefore, ICC is not able to consider such cases unless UN Security Council appeals there (UN Security Council will never do that) or unless Uzbeks commit crimes against humanity in Tajikistan or Georgia", says Kirill Koroteev, the international relations lawyers, teacher and research fellow at Strasburg University. – "There is another problem that mixes up European Human Rights Court and the courts of European countries. Many states recognize the principle of universal jurisdiction: the courts are competent to consider criminal cases against third countries’ citizens for the crimes, committed in third countries against the citizens of third countries if such criminal cases involve crimes against humanity, tortures and etc. The attempt to bring Uzbek Interior Minister to trial in Germany for Andijan massacre failed: German authorities let him go". Mark Ruppert: Both. Lawsuits are submitted by everyone from people from Andijan to whoever was harassed for his or her faith to businessmen swindled out of their businesses. Some applicants demand restoration of their smeared repute, others insist on indemnity. The Uzbek executive branch of the government made so many gross mistakes and violations that we have a good deal of opportunities in phrasing lawsuits in any manner that suits us. Besides, we insist on indemnity whereas lawyers in Europe are expensive. I talked it over with some lawyers, however, and they agreed to work for a percent of the future indemnity. Both Uzbek opposition parties and free-lance human rights activists participate in the project, these days. Preparations are under way. Take a look at Erk activists in Europe... or at the ones who represent Birlik. Calling them political organizations before now required a certain stretch of imagination. They were as good as guerrilla fighters, constitutionally unable to reach an agreement. Not any more. This project appeared and initiated their rapprochement. We even consider establishment of a new opposition movement, the one that will comprise all these mavericks. Mark Ruppert: Take a look at Pinocet. Ferghana.Ru: Chile does not have gas. Mark Ruppert: Yes, Uzbekistan has gas. Upset by the latest escapades of Russia and Ukraine in the matter of gas export to Europe, the European Union is looking for ways and means to detour Russia. Sure, the European Union might go to great lengths under these circumstances. But if collective lawsuits are submitted, the European Court of Human Rights cannot help accepting them. Sure, its verdicts will have but a token importance for Uzbekistan - but not for Europe. With verdicts of the kind we expect, European human rights organizations will no longer be able to draw reports like the ones they drew so far. Second, financial analysts will have to bear these verdicts in mind. And third, major European businesses will finally see that Karimov is not a man to deal with. This project will deliver a serious blow at Karimov's administration and at Karimov himself. A serious blow indeed. Ferghana.Ru: Do you really expect Europe to start confiscating Uzbek assets and turning them over to Karimov's victims? Mark Ruppert: Yes, we do. There were precedents, you know, when Europe arrested foreign aircraft and other assets.